This is one of my all time favorite recipes. I love making the sauce that goes with this lasagna because I'm constantly taste testing (it's the only way to make it perfect). The two key ingredients in the sauce are the sugar and the vinegar. I prefer my sauce a little tart so I always find myself adding extra vinegar. Ok... to the recipe! The cheese measurements don't need to be exact. 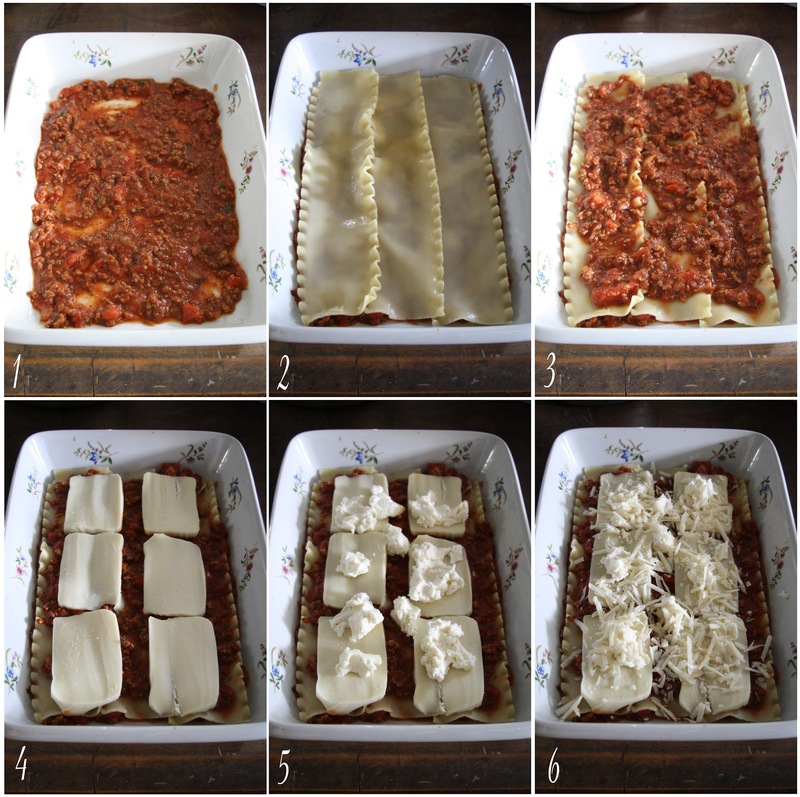 It all depends on how you create your lasagna. Personally, I'm not a big ricotta fan but I ALWAYS use a ton of mozzarella. Also, since I'm always taste testing my sauce, I don't have exact spice measurements. This recipe makes a large amount of sauce... the extra is to pour over each slice of lasagna when you serve it. 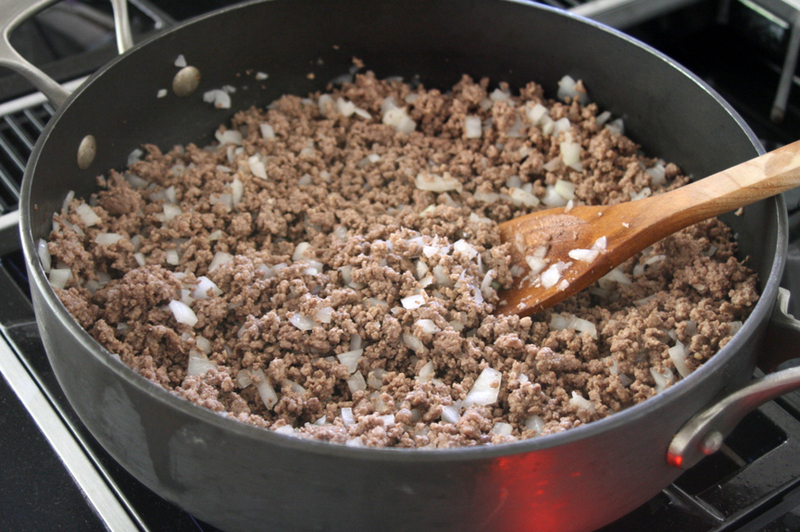 Brown the ground beef in a skillet until cooked through. Put some paper towels in a bowl. Using a slotted spoon, remove the beef and place it on top of the paper towels to drain the excess grease. Wipe the skillet clean and add the diced onion. Sauté for a few minutes over medium heat. Add the browned beef back to the skillet and continue to cook for 5 more minutes. Transfer the beef and onions to a large pot. Dice the stewed tomatoes. Add the diced stewed tomatoes, tomato sauce, and tomato paste to the pot. Add about 1 tbsp. of oregano and 1 tbsp. of Italian spice mix. Chop the parsley and add it to the mix. Now comes the taste testing! Add a pinch of garlic powder, a pinch of garlic salt, and a dash of white wine vinegar. Add the sugar a tablespoon at a time until the sauce reaches your desired sweetness. I could just sit and eat this sauce with a spoon... it's that good. Allow to simmer (and thicken) for about 30-45 minutes. Cook the lasagna noodles according to the package. Like I said before, you only need 9-12 (depending on how many layers you do) but I make extra because they break. I like to add a little olive oil to the water to prevent them from sticking. Once they are al dente, drain them and keep them in a pan of cool water (also to prevent sticking). 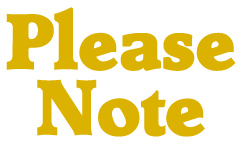 Begin to cut your mozzarella and grate your parmesan. I also grate a little mozzarella for the top. Repeat these steps 3 or 4 times (depending on the depth of your pan). Add sauce and grated mozzarella on top. Tent the lasagna pan with aluminum foil. Don't let it touch the sauce or the cheese! Bake at 375 degrees for 45 minutes. Allow to cool before serving. Slice and serve with extra sauce on top! Ive been dying to try my hand at lasagne recently and this sounds like a gorgeous recipe, definitely saving this little lovely :) comfort food at its finest! It certainly is! This is the ULTIMATE lasagna... I can't stop eating the sauce while I make it! Agree with all the commenters said. This is really delicious! I can't find a better word for it. I always have a thing for lasagna. I love the cheese, the sauce and the overall taste. Thanks for sharing this. I'll definitely make this at home. This looks delicious! Can you tell me how many servings for this recipe and how big the pan needs to be? The pan should be about 13 x 9 x 2 preferably stainless or ceramic because aluminum can ruin the taste of the sauce (which is the best part). This lasagna can feed up to 8.